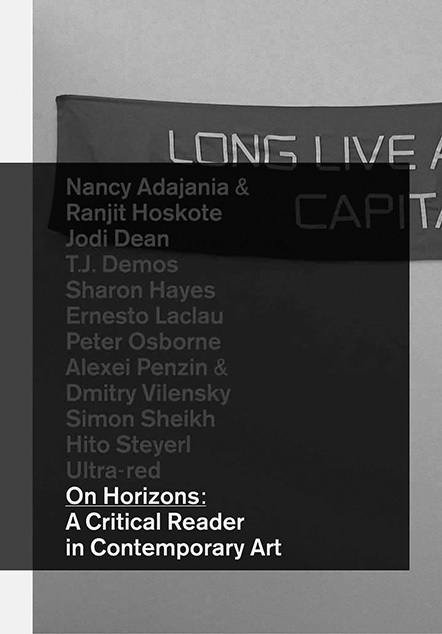 On Horizons, the fourth critical reader published by Utrecht’s centre for contemporary art, BAK, comprises a selection of texts in which an attempt is made to study the present ‘Western’ condition in art and society on the basis of the concept of ‘horizon’, according to the editors. This reader is a continuation of the theme presented in the autumn of 2010 at BAK in the group exhibition ‘Vectors of the Possible’, curated by Simon Sheikh, and at the second Former West Research Congress, ‘On Horizons: Art and Political Imagination’, which took place in Istanbul and was organized in collaboration with skor. The compilers of this volume, Maria Hlavajova, Simon Sheikh and Jill Winder, pose the question: Is the notion of ‘horizon’, in the philosophical and artistic sense, an instrument that can be used to reformulate the relation between art and politics? Can we create possibilities for artistic practices and political projects by breathing new life into the concept of ‘horizon’, repositioning it in today’s world ruled by neoliberalism? In this book, artistic and art historical contributions by Sheikh, T.J. Demos, Hito Steyerl, Ultra-red and others are grouped around the philosophical essays of Ernesto Laclau and Peter Osborne. T.J. Demos signals a tendency he calls ‘curatorial utopianism’. A renewed engagement with utopian ideas is discernible in exhibitions, observes Demos. In art institutes, an attempt is being made to escape the grip of the existing context through a willingness to change the economic and political situation. Attractive alternatives for the political status quo are being created. Demos examines how these are being realized on the basis of the nomadic project Utopia Station (2003–present), the exhibition ‘Forms of Resistance’ (2007–2008) in the Van Abbemuseum and the 11th Biennial of Istanbul (2009). ‘Forms of Resistance’ was primarily a research exhibition, which lacked dynamics and dialogue and was difficult to fathom for non-initiated visitors. In ‘Utopia Station’, ‘utopia’ is used as a catalyser so as to study that concept in a non-hierarchical, decentralized manner. Whereas both of these projects tended to degenerate into a non-place for institutional or discursive invisibility, the curators of wdw / What, How and for Whom?, responsible for the 11th Biennial of Istanbul, best understood that risk, according to Demos, and also turned it to their advantage. Polarizing political statements, which cannot be excluded in a ‘utopian’ exhibition project, frighten away stakeholders in the economic and political sense. wdw utilized a pluralistic agenda, with which it was able to break into the neoliberal system. The biennial accepted co-financing from the industrial conglomerate Koç Holding, for example, without relinquishing its demand for the possibility of applying a Brechtian aesthetics to contemporary art. The often heard criticism that this approach would undermine the credibility of the biennial with regard to content is too easy, argues Demos. As he prefers to see it, existing systems are ‘functionalized’ in this manner, so that art can be thought of beyond its form as an overall spectacle or gross entertainment. In her notes, artist Sharon Hayes analyses what she calls ‘arresting images’ step-by-step. These are images of, for instance, important protests, physical ‘acts of resistance’ or acts of violence against the state that attempt to disrupt the prevailing narrative in which ‘historical time’ is philosophically interpreted as progressive. Hayes cites what have proven to be the visionary statements of Malcolm X uttered before he was murdered in 1965 as an example of arresting images. And she refers to Robert Smithson’s ‘non-sites’, places that in the form of photographs or films are directly connected with a specific time and place, without actually being those places. Yet these non-sites-as-images bind us to themselves, says Hayes. So, she wonders, might images be able, like Malcolm X’s words, to create spatial expectations, to bring about a future experience? Hayes inverts the conceptual alliance of the two historical categories of ‘horizons of expectation’ and ‘spaces of experience’ postulated by Reinhart Koselleck, the German theoretical historian. Koselleck historicized the concept of ‘horizon’, which already had a longer tradition in philosophy, relates Peter Osborne. ‘Horizon’ is connected with expectations. At the beginning of the twentieth century, Edmund Husserl redefined Augustine’s theological implications of this concept, resulting in a phenomenological description of a ‘horizon of expectation’. This is characterized by a ‘determinable indeterminateness’; it is veiled in mist and can never be completely determined, but is inevitably there. According to Husserl, explains Osborne, a certain movement is inherent on the horizon. The horizon forms a naive and natural constituting facet of the human position. The horizon precedes reflection and simultaneously defines, in its indeterminateness, human finiteness. Martin Heidegger adopted the possibilities and expectations sketched by Husserl, adding the notion of time as an existential, ontologically fundamental concept. In doing so, he set on edge the definition of what ‘possibilities’ or ‘expectations’ are. If you expect something, then you are waiting for the actualization of ‘something’. You therefore are ready to have ‘it’, for after all you are anticipating ‘it’. So-called ‘possibilities’ therefore do not exist. Conversely, Heidegger’s concept of ‘anticipatoriness’ (Vorlaufigkeit), includes human existence, in which possibilities are inherent. Against the background of this philosophical discourse, Osborne formulates his criticism of Koselleck. The German historian refers to the difference between ‘experience’ and ‘expectation’, a gap that arose during modernity, and, in retrospect, in history in general as a result of the modern understanding of time. It has led to the fact that possibilities are produced at the cost of passing reality. But according to Osborne, Koselleck has not sufficiently thought through the dialectics between ‘experience’ and ‘expectation’. This is also true of the way in which the ‘historical understanding of time’ is determined by the historical development of capitalism and communism. Using the collapse of communism in Eastern Europe and the Twin Towers as examples, Osborne demonstrates that Koselleck’s concept of horizon lacks the unexpected, as formulated in Heidegger’s Vorlaufigkeit, and the indetermined (Husserl’s ‘indeterminateness’). And thus, concludes Osborne, it is precisely thanks to this unexpected aspect, which we also encounter in contemporary experimental art practices, that punctures can be made in the ‘horizons of expectation’. How these punctures can be visualized is explained by Hito Steyerl in her paper ‘In Free Fall: A Thought Experiment’. Whereas the majority of contributions in On Horizons focus on the philosophical context of the concept of horizon and its political applications and implications, Steyerl brings up its art historical employment. A horizon suggests stability; it defines the boundaries of communication and understanding. Beyond the horizon is muteness and silence. In painting, the surveyable, calculable, homogenous space, and therefore the linear, predictable notion of time, was represented by means of central perspective. In J.M.W. Turner’s paintings, and later on in futuristic works, that unity was undermined. In contemporary representations, a vertical perspective is increasingly being used, or the perspective of the absent pilot, as Steyerl says. Precisely where, for example, is the perspective in James Cameron’s film Avatar (2009)? In this and other contemporary works, the solid ground beneath our feet turns out to be extremely fragile and fragmented. We are transformed into hypothetically floating viewers. Actually, suggests Steyerl, we are even in a continual freefall. In the new visualizations, we are flooded with a dislocating, disorientating gaze. This creates artistic possibilities. The perspective of the freefall forces us to reconsider verticality as a social theme – and to rise in action against the difference between above and under, rich and poor. Thanks to this and other inspiring contributions and to careful editing, On Horizons makes for hard-to-put-down reading. In these turbulent times on the economic and political fronts, both nationally and internationally, the book formulates, contextualizes and conceptualizes possibilities for artistic projects. Eventual difficulties and pitfalls are pointed out by T.J. Demos and others. In general, the authors seem to have maintained a positive tone in their essays. The word ‘hope’ is even mentioned. Could a new interpretation of the concept of ‘horizon’ actually have been found in the BAK’s critical reader?